Home › Loans › Mobiloans Review 2019 – Fast Cash But At What Price? Mobiloans has a compelling first glance offering which is to provide you with a line of credit as a more flexible way to borrow emergency cash. The idea is to save yourself the penalty costs of overdraft bank fees and payday loans. Mobiloans claims it offers a payment method that has no hidden fees or prepayment penalties so you can take care of everyday expenses. And the lender can provide you credit without needing to sign up for a credit card. If you need extra cash to tie you over until your paycheck, Mobiloans can get you anywhere from $200 to $2,500 in as fast as the day after you apply. And it claims that a typical overdraft fee would set you back $35 while a Mobiloans line of credit would cost you just $6. But does the math workout when you dig a little deeper into the total costs of borrowing from Mobiloans? How Much Are Mobiloans Fees? Mobiloans Review: What Is The Total Cost? Mobiloans makes as much as $2,500 available to new customers but is a very expensive way to access cash if you don’t pay back the full amount within the first billing period. As a new customer, you are entitled to a line of credit of anywhere from $200 → $2,500 from Mobiloans. The money you draw goes to your checking account. Or if you wish, you can receive a check. Unlike a credit card, you won’t be charged daily interest. But don’t let the lull you into thinking you are getting a better deal. You will be required to pay a cash advance fee for every $20 you draw. If you can afford to pay back the full amount within the first billing cycle, no other fees apply. But while Mobiloans makes borrowing sound easy, simple, and fun, you should carefully examine the total repayment costs before you proceed. Mobiloans charges you a rich cash advance fee for every $20 you need and a steep fixed finance charge is applied every couple of weeks if you don’t pay back your loan within the first billing cycle. When you draw a line of credit from Mobiloans, you are charged a cash advance fee. And make no mistake about it, the cash advance fees are large. When you borrow $500, you pay a $75 cash advance fee that represents 15% of the total amount borrowed. And when you borrow the maximum $2,500, you pay a fee of $225, which represents a fee of 9% of the total borrowed. You can see quickly that the cash advance fees alone are very high. However, more fees are imposed if you need more time to make repayments beyond the first month. A minimum charge is calculated based on a tiered structure depending on the unpaid balance. The so-called Fixed Finance Charge is applied to your balance each billing cycle. And each billing cycle is approximately 2 weeks (every other week or twice monthly). Each billing period, you are required to pay the higher of $20 or 5% of the outstanding balance. So let’s say you have a $202 principal balance outstanding, you will get hit with a $35 fixed finance charge, equivalent to 17% of the amount you previously owed. Now imagine you decide to pay the minimum balance of $20, how much will you owe next month? It turns out you will owe $217, which may cause you to scratch your head because you only had $202 to pay back last month but now the fixed finance charge means you have $15 more to pay back, equivalent to a 7.4% monthly increase on your balance due. To give you an idea of how high that amount is as a percentage, if you had to pay 7.4% more each month for a year, you would end up with a balance amount almost twice as high as the amount you owed at the beginning of the lending period. When you borrow just $100 and pay back at a rate of $50 per billing cycle, your APR rate is an astonishing 469%. When you combine the cash advance fee plus the fixed finance charges that hit you every two weeks if you don’t pay back the full amount within the first billing cycle, the total cost of a Mobiloans line of credit is high. In fact, it so high that we encourage readers to shop around extensively because you might find that Mobiloans is an even more expensive option than choosing a payday lender. The reality is that if you need an emergency loan, you may need more than a few billing cycles to pay it off. Let’s imagine three borrowing amounts: $100, $200 and $500. How much would your APR rate be and how many billing cycles would you need to pay off your loan assuming you could make a payment of $50 per billing cycle or $100 per month? Even a modest $100 line of credit paid back at a rate of $50 every two weeks will take two months (4 billing cycles) to pay off when you factor in all the recurring finance charges plus the cash advance fee. Double that borrowing amount from $100 to $200 and it will take almost half a year (10 billing cycles or 20 weeks) to pay off the full amount even when paying back at a rate of $50 per billing cycle! If it makes you sit back in amazement when you compute these numbers, it is because the APR rates are very, very high after factoring in the recurring fixed finance charges. Intuitively, you might think that if you borrow $200 and pay back $50 every two weeks, it will take you about 8 weeks to make a serious dent on your principal and an extra billing cycle or two to pay off fees. But the reality is it won’t take 10 or 12 weeks but a whopping 20 weeks to pay off your loan. To pay back a $100 loan will cost you a total of $175 at a repayment rate of $50 per billing cycle and the staggering total cost of paying off a $200 loan is $485 when you include fees at the same repayment rate. Now here’s the most frightful calculation. If you borrow $500 and choose to pay back $50 per billing cycle, you will never escape the debt. Obviously that goes for all higher amounts too. In the map below only the states in purple are serviced by Mobiloans. Does Mobiloans operate in your state? Check out the map below to instantly see the states in which Mobiloans does service customers. 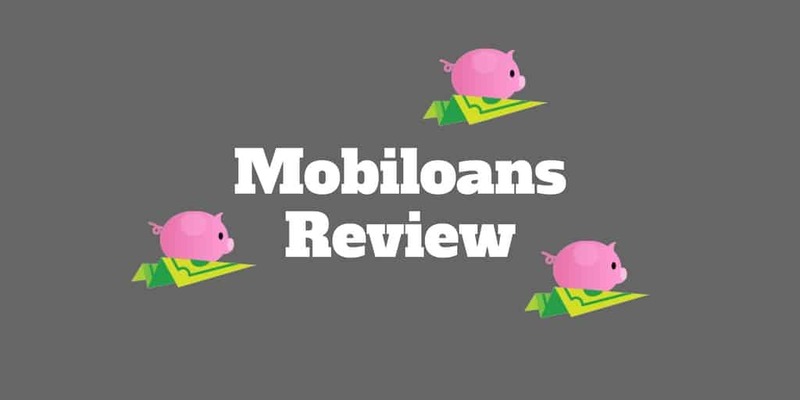 Mobiloans provides borrowers fast access to emergency cash and is reasonably priced if you can afford to pay back the full amount within the first billing period but if you cannot, you could quickly find your outstanding balance due spiralling higher. ✅ Fast Access To Cash: Borrowers can get fast access to cash as soon as the next day. ❌ Expense Cash Advance Fees: To get a line of credit, you may pay as much as 15% of the total amount borrowed in initial fees. ✅ Reasonable For Fast Repayments: Mobiloans is priced reasonably if you can afford to pay back the full amount within a single billing cycle. ❌ Fixed Finance Fees: If you fail to repay your line of credit within a single billing period, penalty fees called fixed finance fees accumulate quickly. ✅ Cash Up To $2,500: Anywhere from $200 to $2,500 is available to new customers. ❌ Billing Cycle: The billing period is calculated as every other week or twice monthly not every month, so fees accumulate quickly. ✅ BBB Rating: Mobiloans earns a B+ rating from the Better Business Bureau. ❌ Minimum Payment: If you make minimum payments on even small loan amounts, you may find yourself with a larger balance next month than the current month. ❌ Perpetual Debt: It is mathematically possible to find yourself in a situation where you can never pay off the debt if you can only afford a small fixed or minimum amount each billing period. ❌ Coverage: Mobiloans does not have nationwide coverage. When you sign up for AutoPay, Mobiloans will deduct the minimum amount from your checking account. If you signed up to Mobiloans for emergency cash to avoid overdraft charged, beware that the AutoPay feature will still attempt to debit cash from your account even if you don’t have it, meaning you will get hit not only with Mobiloans fixed finance charges but also the bank overdraft fees you were originally seeking to avoid. However, you can elect to receive your funds via check and sidestep AutoPay to avoid the risk of getting dinged with bank overdraft fees. Mobiloans can lend money quickly if you need cash fast in an emergency situation. It is possible to receive funds as soon as the next day. And if you pay off your credit line within the first billing period, it is reasonably priced. However, if you cannot afford to pay more than the minimum amount per billing cycle, you get hit with fees every two weeks. These fees can accumulate so rapidly that on a $500 line of credit, you could end up with a spiraling debt liability that could never be paid off if you pay back only the minimum amount each period. The APR rates are very steep and so, if you do need access to cash in a hurry, it would be wise to shop around and compare rates from other lenders. iLoan, OneMain, and Peerform are Mobiloans alternatives.